Independent product review by Sound on Sound, the world's best music recording magazine. Will the C16 work with such-and-such? The music-making equipment that most of us can afford gets ever more powerful. Unfortunately, this gear still tends to lack any genuinely accessible User interface. Consequently, a cost-effective hardware MIDI control box could be a very handy device. The Philip Rees C16 MIDI Control Unit has sixteen 60mm slider controls. The sliders may be assigned to a wide variety of MIDI parameter and variable change functions. The assignments are held as one hundred preset Target templates, built-in to the C16. The preset Target templates are selected by number, using two of the sliders, while holding down the TARGET SELECT pushbutton. The currently-active TARGET NUMBER is shown on a two-digit seven-segment numeric LED display. The use of lots of presets means you won't freak out trying to program this MIDI control box. You can use the sliders on the C16 to control volume, pan, effects sends, and many other parameters of many popular electronic musical devices (old and new). The C16 is pre-programmed with the MIDI Control Change, MIDI Parameter and MIDI System Exclusive codes for manipulating the sound on a wide range of popular synths, sound modules, sound cards and software. Therefore, this versatile MIDI control surface can act as a hardware front panel for a synthesiser or as a compact MIDI mixer. Every good boy deserves faders. In a typical MIDI set-up, you might place the C16 between the MIDI OUT of your master keyboard and the MIDI IN of your sequencer (hardware or computer). In this way, your sequencer can record the movements of the sliders. This feature gives the User easy access to expressive effects such as trendy filter sweeps. The C16 automatically merges the MIDI data from the keyboard with that generated by moving the sliders. This means that you don't have to swap around MIDI cables, and you don't require an external merge unit. The diagram on the right indicates where you might place C16 in a simpler set-up, without a sequencer. There is also the option of user-programming two Target templates (Target numbers 98 and 99), each consisting of sixteen sliders. You can transfer the settings for these thirty-two sliders to the C16 via System Exclusive messages. These settings are held in non volatile-memory, so the information is retained when power is removed from the C16. This feature means that, when used in conjunction with a computer, the C16 becomes a fully programmable MIDI control center. It also means that, new Target sets can be provided for existing users, for example, via this website. To help with generating and editing User Targets (and transmitting them to the C16), we provide free C16 Editor programs for the Macintosh® and PCs running Windows®. A sixteen-position rotary switch is provided; it is usually used for selecting the MIDI channel, or sometimes the device number. Target number 7 is called Quick Mixer, it provides easy access to volume, pan, reverb send, chorus send, variation effect send, balance and expression across sixteen MIDI channels simultaneously. The channel numbers correspond to the slider numbers. When this Target is selected, the sixteen-position rotary switch is used to change functions, so you can simply and rapidly switch between them. There is a SEND ALL pushbutton, which updates the target device with all the slider positions. A lamp in the display window flashes to clearly indicate when MIDI data is transmitted by the C16. The lamp flashes for data being transferred from the MIDI in port, as well as that generated as a result of movement on the front panel controls of C16 itself. Space is provided on the hardy polyester front panel to name the slider assignments; a permanent overhead projector pen is a suitable marker. The C16 features a built-in power supply and is supplied with a detachable mains lead (ac power cord). As with all our mains (ac) powered products versions are available for 110 V ac as well as 230 V ac. Plugs for various international standards are also available. The sturdy ABS enclosure is compact at 210mm x 135mm x 55mm, so it doesn't take up too much space on a crowded work-surface. It has one MIDI IN and one MIDI OUT port with an automatic merge function. The unit alone weighs 550g, and complete with enclosures and packaging the gross weight is about 1.2 kg. With an outstandingly good service record, the C16 has firmly established a reputation as a very robust and reliable product. The C16 information on this page (plus a Target & sliders chart) is available as an Acrobat .pdf file - size: 1058K bytes. Proprietary names are used to indicate intended compatibility of MIDI messages. They do not imply the approval of the nameholder, which has not been sought. 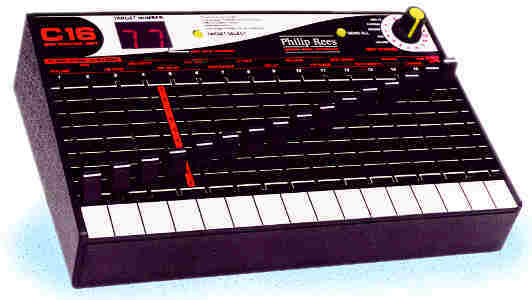 The C16 provides a hardware MIDI control surface with 16 sliders.